Awarding €2.4 million in funding from the European Union's Horizon 2020 research and innovation programme, the WEAR Sustain initiative has become the catalyst behind the development of sustainable wearables. Managed by a consortium of seven organisations across five EU countries, WEAR Sustain's main objective is to fund 48 projects. So far, it has funded 23 pioneers of ethical and sustainable wearables, and smart textiles through the Spring 2017 Open Call. Each winning project has been given €50,000 to develop their idea – we decided to check in with some of the winning startups. The competition has introduced us to some out-of-the-box ideas like the collaboration between Hellen van Rees and the Designlab at the University of Twente in the Netherlands. Presented as Textile Reflexes, the team also includes researchers Angelika Mader and Geke Ludden. Textile Reflexes' approach allows them to come up with a dynamic and playful smart fabric that easily adapts. "We want to make a shape changing textile that can be applied in wearables," explained van Rees. "If the shape changing textile is connected to the internet, we get to robotic textiles as a part of the Internet of Things". Simply put, the team is taking textiles as the basis for their prototype and adding technology in a subtle way, with the hopes of creating familiarity for the user. "We want it to feel comfortable, like a garment instead of a machine. The choice for material should thus take comfort, design, sustainability and quality into consideration. This way we aim to create a wearable that is suitable in coaching situations and daily life," she told us. With plans to launch their demonstration in early 2018, van Rees explained: "The €50,000 will be used for research and development mostly, but also for external advice, use of machines and materials". The exploration of textiles does not stop with Textile Reflexes; another WEAR Sustain winner is Sensewear. They offer a customisable tech solution embedded with sensors that monitor select physiological parameters so as to determine stressful conditions. Founded by Italian designers Ema and Ivan, Sensewear's first prototype was created to prove the validity of their concept. The second prototype, which they are currently working on, is composed of a sensing unit and textile sensors connected to an electronic device that plays a key role in the product's therapeutic functionalities. Alongside the product is an app that works with either a smartphone or a tablet so as to help visualise the wearer's condition and record their data and progress. Developed in cooperation with autistic children, their families and therapists, Sensewear's collection includes an inflatable jacket, stretchable and aromatic scarves, a chewable necklace and a musical poncho. "The technology is hidden in order to increase the level of acceptance and the psychological comfort of the wearer," said Ema. "In a second stage of our enterprise we'll be focusing on adults affected by autism, health conscious people, the ageing population and anyone who wants to experience their senses from a different perspective." For now, Ema and Ivan hope to retest their products more widely in autism centers, before giving Sensewear to early adopters in the first quarter of 2018. Taking a slightly different approach to both Sensewear and Textile Reflexes is Closed Loop. The project is a smart athleisure collection designed to continuously measure the wearers' key vital signals. The project is based on the Holst Centre's advanced printed sensor technologies that are wearable, comfortable, robust, invisible (during use) and washable up to 25 cycles. The initiator, coordinator and driving force of the Closed Loop project is Marina Toeters, whose approach is based on three considerations. She explains, "The three pillars are technical materialisation, designing based on fashion rhetoric and business loop. The closed loop system is an innovative approach to wearable technology, focusing on the afterlife of electronic garments and potential recyclability". Margreet de Kok, the technologist of the team adds, "We want to make these innovations available for the garment industry and, with that, the everyday user, so that garments can start taking care of consumers". Another Dutch innovator working within the smart fabrics space is material designer Aniela Hoitink, founder of NEFFA. Her WEAR Sustain project is called MycoTEX and it is focused on changing the complete supply chain by researching how textile and clothes will act in the future. Motivated by the belief that textile is an extension of the skin, Hoitink is interested in mimicking it and all its dynamic, changeable and living aspects. "We have started by growing a 100% biodegradable material of mycelium," she told us. "This is then placed onto 3D moulds to make a garment and integrate electronics. 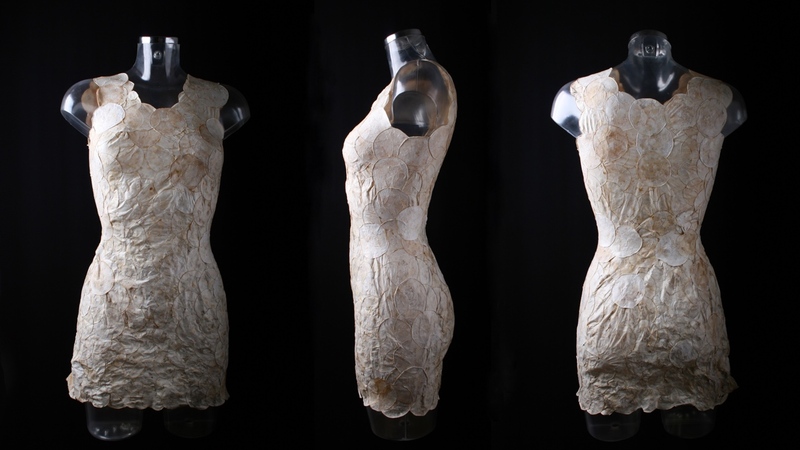 The idea is to make biodegradable clothes that last as long as the technology is working." Focusing on studying different aspects of the skin (colour change, growth, nurture, etc), Hoitink is also exploring how textiles could take care of us in the same way our skin does now: "Our skin is responding to the way we are and feel, what we do and how we behave. So each textile will act differently based on the wearer, because we all have a different skin." Sustainability is the driving force of the company. "Why do we make clothes that last for 40 years if nowadays we only wear them for one or two years?" says Hoitink. "Our aim is to integrate technology in a fully biodegradable textile, so after usage we can simply compost the material and collect the remaining electronics for recycling." Still in the prototype phase, Hoitink admits that it will take a few years of research before MycoTEX's products are market-ready. Among the 23 projects so far is Quietude, a wearable designed to enhance the experiences of deaf women. Quietude's line of smart jewellery and accessories has moving parts that generate a vibration which informs the wearer of the intensity and quality of sound in the environment. "By wearing these accessories, the deaf women will be able to perceive voices and other sounds through their body,"explained Patrizia Marti, professor of human-computer interaction at the Eindhoven University of Technology. Hoping to make a positive impact in a sound-oriented world, the products will come with an app (iOS and Android) that provides a control panel for managing the sensor precision, vibration strength, sound recording and the quality of the haptic feedback. To get technical, the fashion tech devices are composed of several electronic boards embedded in the accessories. The boards are equipped with microphones, processing units and actuators. The electronics are connected to a smartphone via Bluetooth, in order to allow users to manage and personalise the sound recording and the haptic feedback. Sound recording and tagging functionality allow users to record their preferred sounds, tag them and store them in a library on the phone. This is a key feature of the system since the stored sounds are then used to map an incoming sound, picked up by the mics, that is used to trigger the connected accessories' vibration motors. Right now, Marti is working on developing the experimental proof of concept so she can launch a crowdfunding campaign to cover engineering and industrialisation of the final product: "We hope to do this by improving the aesthetic qualities of the accessories and their functionality, by consolidating the communication system between the app and the accessories, and by validating the entire system with deaf people in different settings." One wearable designed to lend a hand to our wellbeing is Breath! This is a range of smart garments with the ability to help people carry out proper breathing during yoga, pilates and everyday life. Clara Pozzetti is the creative mind behind the project and she's looking to solve a problem that she encountered as a yoga and pilates instructor. "When I was teaching I saw that my students struggled when it came to getting their breathing right. It is the most difficult exercise to perform and to teach," said Pozzetti. With sustainability at the core of their whole system, Breath! is a collection made up of organic cotton mixed with sustainable technological yarns. "We believe that this project is highly sustainable not only because we use natural fibers, but because we take care when it comes to the entire life cycle of the product." So far, the prototype has been tested with various people in yoga classes, including men and women and both experts and beginners at different levels. "The test session proved that it's possible to validate a respiration pattern (from a master) as correct and help the beginner to reach the same level through exercise and visualisation of the respiration rhythm." Also in the realm of wellness wearables is Zishi, a WEAR Sustain funded project that is all about supporting rehabilitation and training using connected tech. Based on helping people maintain the correct posture as they go about their daily lives, Zishi is a functional wearable that merges state-of-the-art sensors with textiles and provides effective and engaging feedback. The team behind the Zishi project plans to focus on user experience, sensing technology, measurement solution, multi-modality feedback, wearability and clinical reliability. Described as "Fitbit for foreplay", smart sensual jewellery line Wisp started life as a Wan Tseng's degree project at Imperial College London and the Royal College of Art. Developed by women for women, the objective is to deliver wearable IoT technology that promises to enhance female sexual wellbeing by simulating touch, kisses and scents. "We are empowering individuals to have a better understanding of their body and to have better intimate experiences through a technological solution," Tseng told us. Following a year of research on female arousal, which included consulting with gynecologists, obstetricians and countless women, the team is developing connected devices that please the senses of touch, smell and aesthetic tastes of women. The "Touch", which can be controlled via an app, collects bio data that allows the user to track their mood and learn about their body and their own sensuality. With plans to focus on zero waste, additive manufacturing, customisation and mini-manufacturing techniques, the Wisp team is currently refining its prototypes. Tests will be held in London in October/November 2017, and Wisp is set to launch in spring 2018. From intimate wearables to everyday hearables, the last project we caught up with was mBrainTrain which is building smart headphones, named BRAWAS, developed by neuroscientists. Its mission? To empower user focus so people can embrace healthy work habits. "BRAWAS uses neurofeedback to learn from physiological data recorded from the user," explained marketing manager Jovana Nikolic. "It motivates users to create healthy work habits, making them more efficient, so they are able to do more work in the same amount of time". The key to this is its mood based music recommendation engine, music being something students and workers have long experimented with as a productivity tool in more informal ways. Currently, the BRAWAS project is in its final product design stage and the team is working with the WEAR Sustain program to accelerate their concept so they can launch the headphones in the second half of 2018. So what is next for the funded projects? Well, they have six to eight months to design and develop compelling aesthetic, ethical, environmental, and sustainable solutions. The projects will continue to receive support and input from WEAR Sustain mentors, experts and hubs like Women of Wearables in London. If you are interested in participating in the next round, note that the second WEAR Sustain open call will be announced this autumn 2017.